Spring is here, which means the flowers are blooming and Easter is on its way. It's also time for that last minute preparation for the summer holidays--low manipulation is probably a good idea this season as it will help your hair become even stronger and able to withstand the summer humidity. 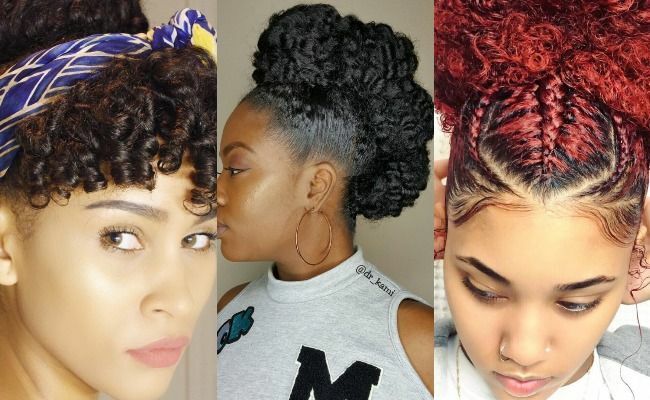 These updos shared by some of our favorite Instagrammers are the perfect way to slay while giving your curls a bit of a break. Girls, gather your bobby pins! If you are good at twisting and braiding your own hair, this will be a great updo for you to try out! The mixture of textures and sizes of twists & braids creates a pretty and impressive look! You can also decorate the style even more by adding some braid beads. This updo adds a twist to your usual Bantu Knots! Instead of creating Bantu Knots all over your head, make two on your crown to leave your hair's natural texture out in the back. You could even Bantu Knot your whole head and then release the back for an even more defined curl. Now this is a good excuse to invest in a quality headwrap! Julz compliments this simple updo with a statement headwrap. If you don't have bangs, you can create a faux fringe by finger curling or using flexi-rods on the front section of your hair. Simply tie the head wrap around your crown and nape, securing with a knot or bow to your liking. For an elegant pin-up look, perfect for work or a special occasion, try out a roller set and simply create two twists on one side of the hair, pinning them back to create the illusion of short hair on one side and longer voluminous curls on the other. This gorgeous jazzed-up curly bun can be recreated by slicking up your edges and forming a large braid in the middle of your hair surrounded by smaller braids on each side. This updo will make a cute pattern and stand out even more on colored hair. The ultimate updo for those who crave a sleek and textured spring look. You can even add hair to the puffs to make them bigger or thicker for those with shorter thin hair. Make sure to add gel and edge control for the sleekness as this is what makes the pinned-back puffs stand out even more. One of the simpler styles on the list but very effective, this top knot is a great style for spring. Use a stretch comb headband to control the back section of the hair, this look is best on shorter hair. The crown braid is such a beautiful updo for all hair types and lengths and can be fun to play around with. Try this style on a blowout for a frizz-free and sleek look. If your hair is shorter, extension hair can be added to the style by attaching to the braid and pinning around the head. Which updo makes your Easter and springtime list? Give your curls a break this spring with some of the above styles.